A man is seen outside the Manulife Financial head office in Toronto after their Annual General Meeting on May 3, 2012. As part of the reorganization, chief operating officer Linda Mantia plans to leave Canada’s largest insurer this summer. Three other senior officers are also leaving or retiring between now and the end of the year. Chief information officer Gregory Framke, chief marketing officer Gretchen Garrigues, and senior adviser to the CEO Stephani Kingsmill, who had previously been head of human resources, have all set dates to depart the company. Like other major financial services players, Manulife is looking to remove layers of management and flatten its structure as the company seeks to speed up a transformation plan to become more digitally oriented. 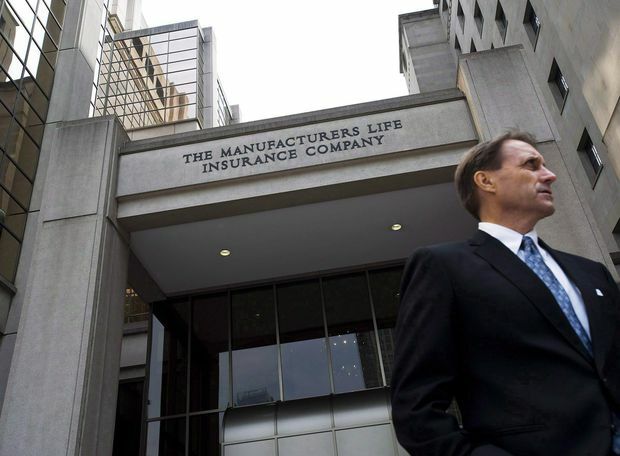 Last year, Manulife began retooling its domestic business by shedding 700 positions through buyouts and attrition, but also hiring new staff with expertise in technology. Under Mr. Gori, Manulife has also sought to remake its image with investors, after seeing its stock price underperform relative to peers since the financial crisis. “These changes will enable us to move with even greater speed, agility and focus as we transform into the most digital, customer-centric global company in our industry,” spokesperson Sean Pasternak said in an e-mailed statement. Ms. Mantia will leave Manulife in July, after less than three years as COO. That role, as designed under former CEO Don Guloien, has a broad mandate overseeing many of the company’s most essential functions, from corporate strategy to innovation. When she joined Manulife in October, 2016, she was responsible for 7,100 staff. Mr. Framke, the chief information officer, will leave at the end of May to pursue other opportunities. To succeed him, Manulife has hired Shamus Weiland, who was most recently head of North America consumer technology at Citigroup Inc., Mr. Gori’s former employer. Mr. Weiland spent more than five years in Singapore as CIO for Citigroup Inc.’s consumer banking business across Europe, the Middle East and Asia. He starts at Manulife on April 15. Ms. Garrigues is leaving “to pursue opportunities in the U.S.," Mr. Pasternak said, and Ms. Kingsmill intends to retire at the end of the year. Under the new structure, the marketing, analytics and innovation arms will be merged under the chief marketing officer, and a search is under way to fill the job. In the meantime, chief analytics officer Cindy Forbes will serve in the role on an interim basis. Ms. Forbes, who was once Manulife’s chief actuary, had previously announced her intention to retire in the near future. Manulife is searching for someone to head their global operations in the new position of chief operations officer, which will have a narrower scope than the role Ms. Mantia has filled as chief operating officer. Under the revised executive structure, the corporate development and strategy units will report to chief financial officer Philip Witherington, regulatory and public affairs staff will be under chief legal officer Jim Gallagher, and head of human resources Pamela Kimmet will be responsible for corporate communications.